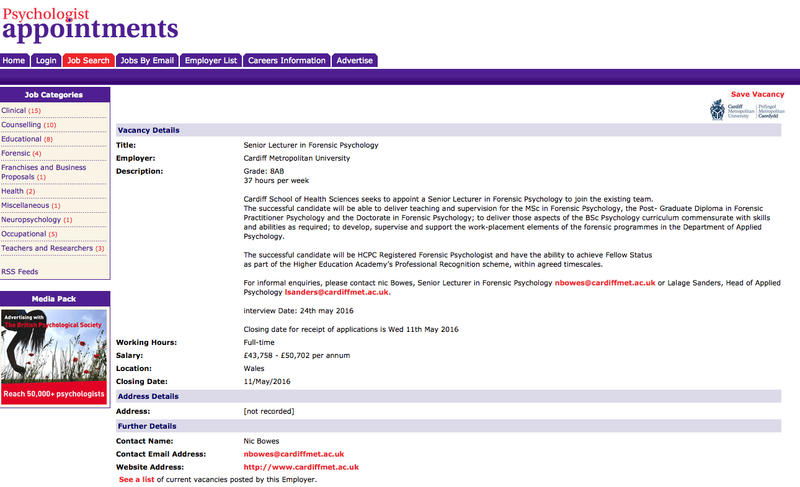 Senior Lecturer in Forensic Psychology in the Department of Applied Psychology, Cardiff Metropolitan University. Work on the postgraduate diploma will involve travelling around the UK to supervise students where they work. The MSc, like the Department, is based at the Llandaff campus in one of the most attractive parts of the bustling city of Cardiff. ‘The MSc Forensic Psychology is focused on critical debate; the department and our students welcome someone with their own views who is prepared to advance new ideas.’ This is a taught programme, though dissertations are often based in applied settings. Find out more on the Psychologist Appointments website.